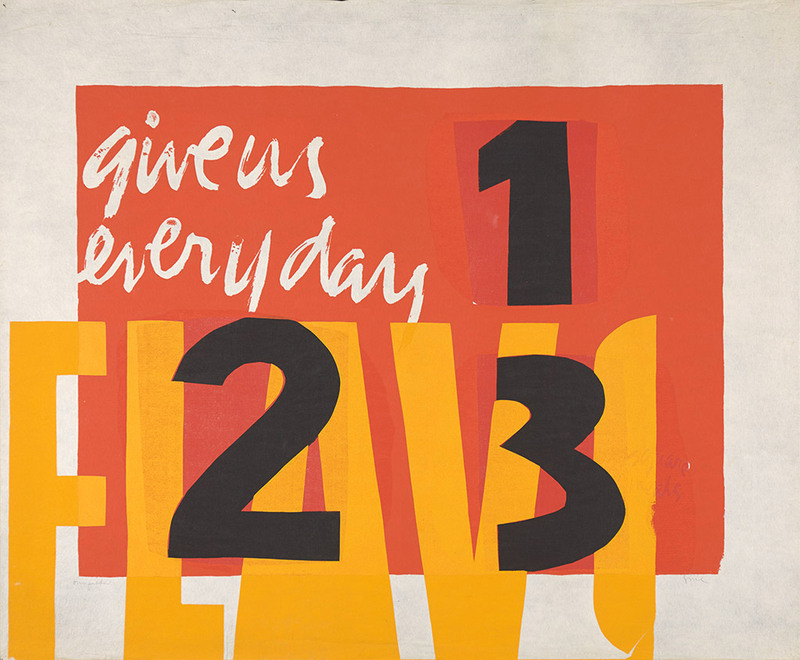 This summer, the playful and powerful Pop art of Corita Kent comes to the Portland Art Museum. 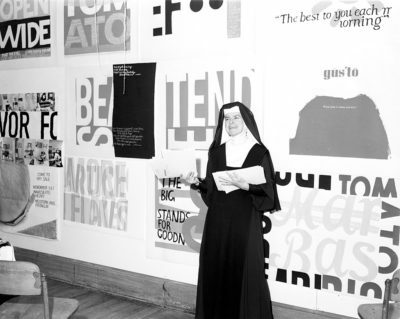 Kent, a nun widely known as Sister Corita, was an important artist, teacher, and activist who gained international fame in the 1960s for her vibrant, revolutionary screenprints. Born Frances Elizabeth Kent in 1918 in Iowa, Kent grew up in Los Angeles; after high school, she joined the Sisters of the Immaculate Heart of Mary and selected the name “Mary Corita” when she took her vows. She began screenprinting in the 1950s, creating dense, expressionist work based on Biblical passages. By the 1960s, Kent had embraced L.A.’s jumbled, chaotic cityscape as a source of inspiration and was incorporating text into her work. For Kent, the advertisements, street signs, and billboards were not, as some saw them, blights on the environment, but rather the equivalent of urban psalms for the modern world. She often appropriated advertising slogans, juxtaposing them with poetry, scripture, and song lyrics and thereby transforming the mundane into joyful messages of hope and calls to action. The effect is at once witty, inspiring, and subversive. In 1968, exhausted from her teaching schedule and the mounting tensions with the conservative archdiocese of Los Angeles, Kent left the city and the sisterhood, relocating to Boston. Her work underwent another decisive change as she turned to a more universal message of peace and personal growth; she died of cancer in Boston in 1986. Corita Kent: Spiritual Pop includes approximately 50 prints that show the full range of Kent’s career, from her earliest experiments to her bold Pop icons and her final, quieter, inspirational work. The exhibition is drawn largely from the collection of the Portland Art Museum, with additional works graciously lent by the Corita Art Center, Los Angeles. 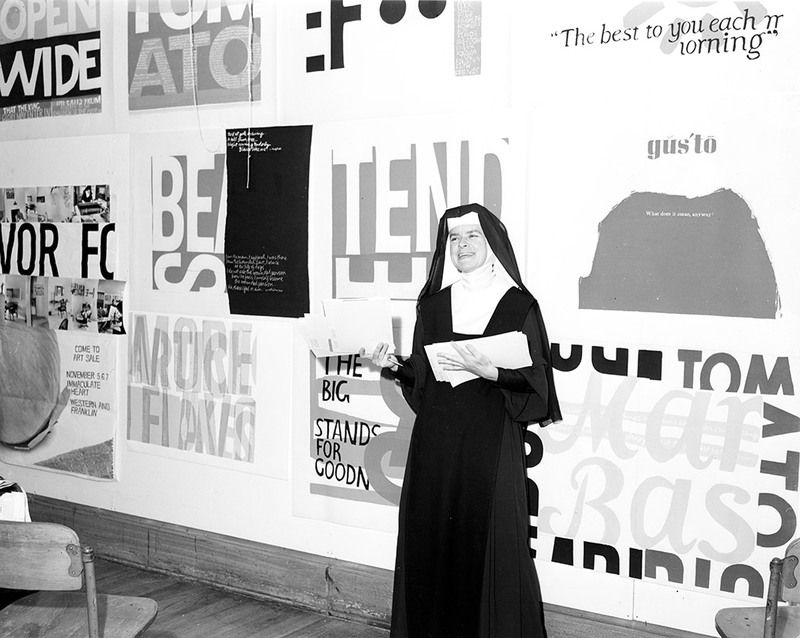 These transcriptions are meant to facilitate understanding of the texts used in Corita Kent’s screenprints. Kent often used small portions of text from larger documents, frequently mingling them with passages from other sources and authors. Note that these transcriptions reflect the work as written by Kent, including her idiosyncratic punctuation and spelling, and may not be identical to the source material. This city is home to one of the most energetic, thriving, and innovative printmaking scenes in the country. From art schools, artist collectives, entrepreneurs, makers, and suppliers to collectors, galleries, and museums, Portland has become a creative hub for making prints. In conjunction with the current exhibitions featuring artists Andy Warhol and Corita Kent, the Museum is partnering with the Independent Publishing Resource Center (IPRC) to host a series of artist residencies, tours, and classes.